An International Baccalaureate certificate gives you a rich and in depth learning experience, ongoing professional development and the flexibility to follow a learning model that best fits your career path. This 15-credit certificate provides advanced professional development for teachers on the philosophy, elements, and assessments of the Primary Years Programme (PYP), Middle Years Programme (MYP), and Diploma Programme (DP). The coursework focuses on the theory, pedagogy, and research under-girding the International Baccalaureate programs. This graduate certificate may be pursued on a part-time or full-time basis. Note: Students must earn grades of B or higher in all coursework. Upon completion of this graduate certificate, teachers may apply to the International Baccalaureate (IB) organization for the IB certificate in teaching and learning. 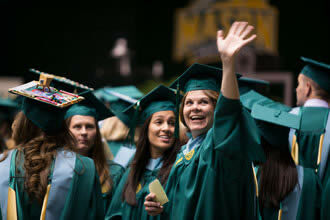 Students who also complete the M.Ed. in Curriculum and Instruction with a concentration in Teaching Culturally and Linguistically Diverse and Exception Learners or the concentration in Advanced Studies in Teaching and Learning may apply to the IB for the IB advanced certificate in teaching and learning research.